This is the new Scafograf GMT from Eberhard & Co. 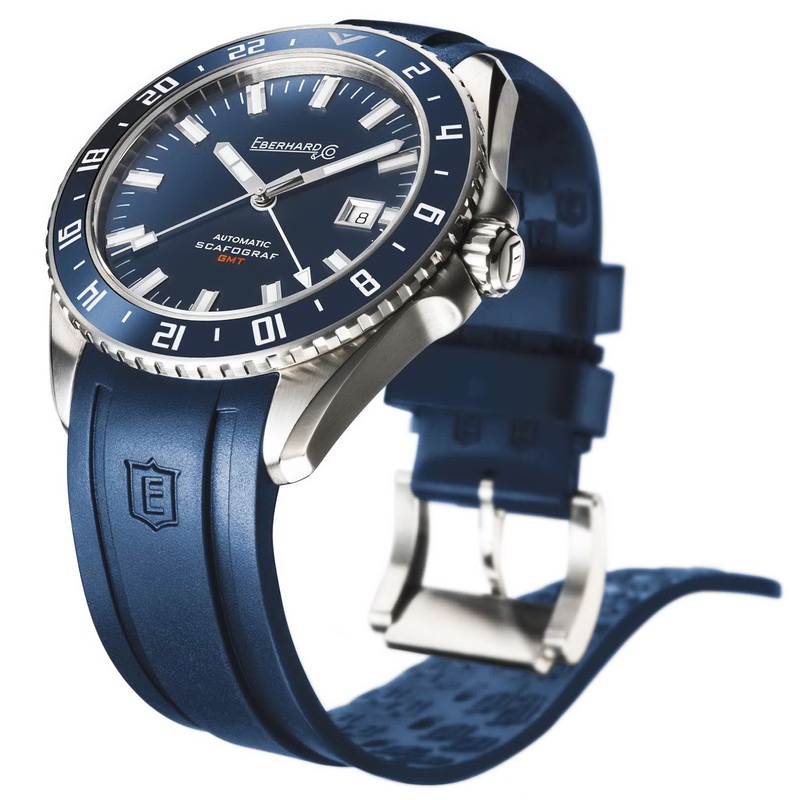 It joins the regular SCAFOGRAF 300 and is in fact pretty much the same watch apart from two points, its movement and its water-resistance. 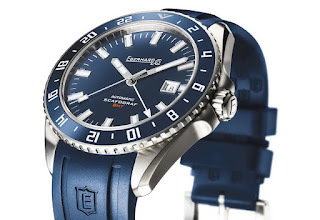 The Scafograf GMT is powered by a Swiss made ETA 2893-2 caliber automatic movement with 21 jewels, a beat-rate of 28,800 vph and a power-reserve of 42 hours. Its functions are: hours, minutes, seconds, date and second GMT. Its case, is in Stainless steel and measures 43mm in dimeter by 11.8mm thick and is endowed with all the same features as the 300 - an AR-coated Sapphire crystal and unidirectional bezel only water-resistant is limited to 100 meters. The only reason I can think for the 200 meter deficit would be the possible thicker movement causing Eberhard to use a thinner case-back? I don’t know? Said case-back features an engraved hemisphere with Time-zones. The steel bezel has a ceramic inlay which is available in either black or blue. It has a luminescent marker at 12 o'clock and a 24 hour scale rather than the dive-time. Its domed dial is also available in black or blue and is with applied luminescent markers. The GMT hand is in orange or white depending on the dial version luminescent. 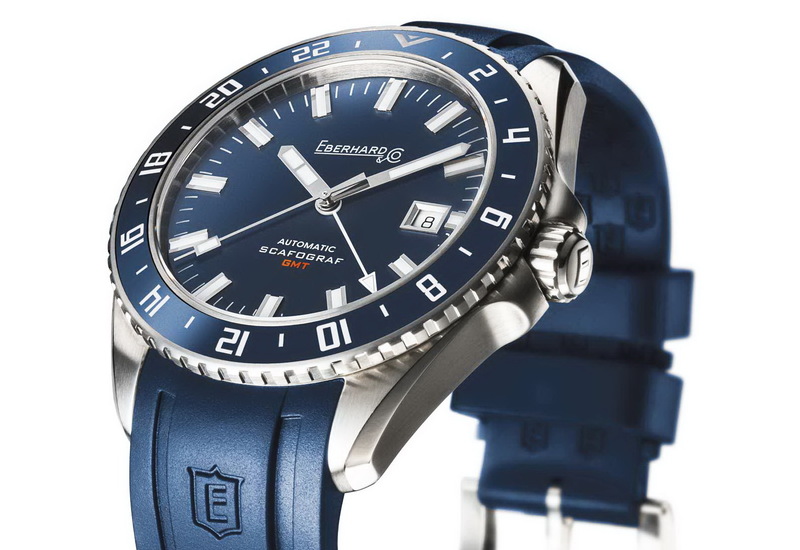 Like its sibling, the GMT comes on a 21mm integrated rubber divers strap, in either black or blue signed with the company's emblem, and a Stainless steel buckle or a Eberhard & Co.’s patented Déclic deployant clasp. A steel bracelet version is also available.